Why am I not a Vodafone customer? After a few bad experiences in the past as a Vodafone Germany customer, I moved my number to O2. Lately, I have faced a problem with the O2 network coverage in my place of work - working at the Vodafone headquarters brings some disadvantages. Bad times with Vodafone happened two years ago and I felt like giving Vodafone another chance. I went to the Vodafone shop located in the headquarters, ground floor, supposedly a flagship store. Me: I am interested in migrating my number from O2 Germany to Vodafone ... I would be looking to a contract that does not tie me for too long to Vodafone ... I do not use much SMS and voice calls ... I only need a good internet package ... I have LG G3 in mind (in the range of 600€) as my preferred device. Saleswoman: I can offer you a two years contract with SMS and voice calls flat rate, the so called RED. Price is 65€/month without the mobile and 85€/month with the mobile. Me: is this the only option? I do not need flat rate and the contract would be too long. Saleswoman: Yes, this is the only option. Me:Thanks for your time and have a nice weekend. Note: I pay around 25€/month to O2 and can cancel the contract with one month notice. Network is fairly good and roaming package very flexible and inexpensive. Well, all the above is why. 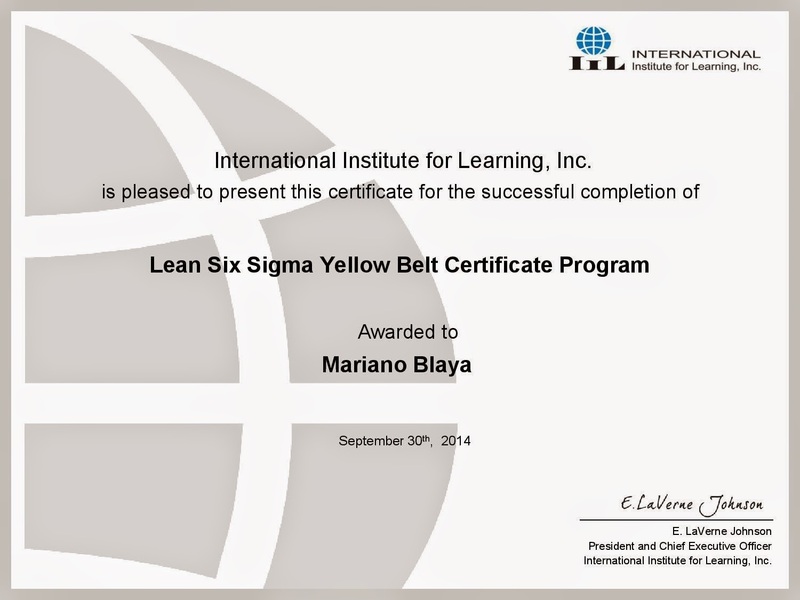 Got the Yellow Belt certification on Lean Six Sigma.